Seriously. Where the hell is my stimulus check? After David took off for work this morning, I decided to do a little cleaning around the apartment. I came across a combo "to do/wish" list of sorts, something David had written. At first I thought about not reading it; David's always writing in his journal, making notes to himself, scribbling down sports stats, etc. I scanned over the paper, reading what one would expect to find; get a better paying job, a better apartment, better diet, design an armband tattoo. We're still discussing that last one. "Love and support Frank and everything he does." Fine. I'll cave on the tattoo. I'm keeping the wallet rummaging, though. 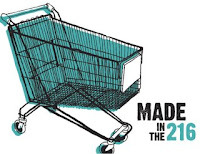 Made In The 216 takes place Friday, June 20th and Saturday, June 21st. I'm excited about picking up some goodies from my recently discovered and now hands down favorite local artist. My stimulus check can't get here soon enough. My name is Miso Kitty. When you read this website you may come across a story about the unusual day I had last week. Normally there's never anything newsworthy about my life. That all changed last Thursday. Of course everything seemed normal at first; I did my usual hiding between the loveseat cushions, I ran around the living room a few times leaping from the highest places I could climb, I played with newspaper like there was no tomorrow. In truth, I spent the day as I spent every other day; quietly enjoying the routine of my life with nary a care in the world. Which is why it was so astounding when late Thursday afternoon I decided to chew through a PSP power supply cord that was still plugged in to the outlet. Sometimes good kitties do bad things. Sigh. Just in case you were wondering if I was one of those idiots who waited in line for over an hour for one of those 23-cent pizzas from Papa John's yesterday: Yes. Yes I was. And I was joined by a few friends: David, my boss, and her two children. At first I thought there was no way in hell I would stand in 50 degree weather for so long for something I could just as easily order and have delivered within half an hour. But then my boss said something that got me thinking: "This is history! It'll be fun! I've waited in line for hours just to ride a roller coaster for less than a minute!" And once again, she was right. It was fun. It was part of something that we Clevelanders will never forget. And you know what? It was the best damn pizza I've had in ages. The whole "cheap eats" thing got me thinking at work today. I can be a thrifty mofo when I need to be. I constantly nag David to turn off lights when he leaves a room, turn off the television if he's not watching (he adores "background noise"), or to shut down the laptop when he's done checking his baseball, basketball, whatever-ball-season-it-is scores online. I'm reminded of a story from my childhood. Don't roll your eyes at me, this is actually cute. My Dad taught us a lesson as kids, we went an entire month without using electricity. No lights at night, no television at all, kerosene lamps and candles surrounding us at dinner time. The total electric bill for that month of conservation was $6.00. Six bucks for a family of six. We each averaged about three cents of electrical usage a day. I remember staring at that statement in bewilderment. And then I felt a rush of relief as I realized that for the first time in thirty days it would be OK to poop with the bathroom light on. I've noticed two odd and irritating imperfections about myself over the past month or so; I seem to be forgetting small, yet nonetheless important tasks at work, and I've become quite the klutz at home. I chalk the forgetfulness up to trying to squeeze too many tasks into my allotted work schedule (and not writing down important details...I love a good 'to do' list); however the klutzy behavior remains unexplained. I wouldn't be so irritated about the occasional falter if I hadn't already gone through a phase of this sort of thing in my twenties. I hated it then, worked to eliminate it, and until recently, did so successfully. My recent bout of the oopsies could be caused by a number of things; Lord knows I have a ton of crap on my mind and a good therapy session certainly couldn't hurt. It's frustrating having space such as this to vent, yet not be able to do just that. So for now, I'm going shopping for a helmet and some shin guards. If you see me around wearing this season's must-not-have accessories, don't laugh. The noise will probably startle me enough to cause a tumble. Up the stairs, no doubt.